It's a good time for 2D platformer fans, with New Super Mario Bros. U Deluxe set to release at the end of the week for Nintendo Switch, allowing players to experience the classic Wii U game on the move for the first time. However, if you're jonesing for Nintendo's next original platformer, one that's built exclusively for the Switch, you won't have to wait much longer – the big N has announced that Yoshi's Crafted World will arrive on the handheld/home console hybrid on March 29, 2019. Yoshi's Crafted World sees the titular egg-throwing dinosaur explore a crafted world that looks entirely handmade, with beautiful cardboard environments comprised of boxes and other household items. 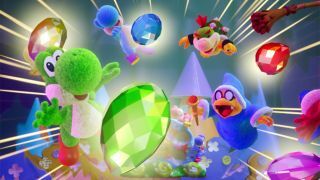 In his quest to retrieve a gem-set stone from the thieving Kamek and Baby Bowser, Yoshi will interact with stages and even flip levels to play them backwards, revealing areas previously unreachable. Along with its release date announcement, Nintendo has also dropped an adorable new story trailer for the game, which you can check out below, along with a release date for Kirby’s Extra Epic Yarn, which will be available for Nintendo 3DS from March 9, 2019.